Prince Street Gallery is pleased to inform you that your work has been selected by Robert Birmelin for our Tenth National Juried Exhibition! Robert Birmelin has selected 40 works, submitted by artists from 42 states. Please submit the exact work that was chosen. Artwork is to be shipped or hand-delivered to the gallery ready to hang. The exhibition will run from Tuesday, July 10 through Saturday, July 28, 2018. 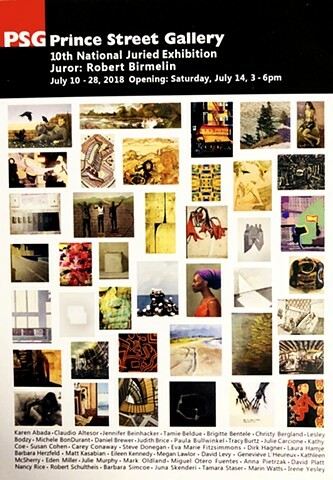 The Opening Reception will be Saturday, July 14, from 3 - 6pm. Robert Birmelin will present a talk on his own work on Friday, July 13, at 6pm in the gallery. We hope you will be able to attend one or both events, and look forward to meeting you. Congratulations again on being selected!